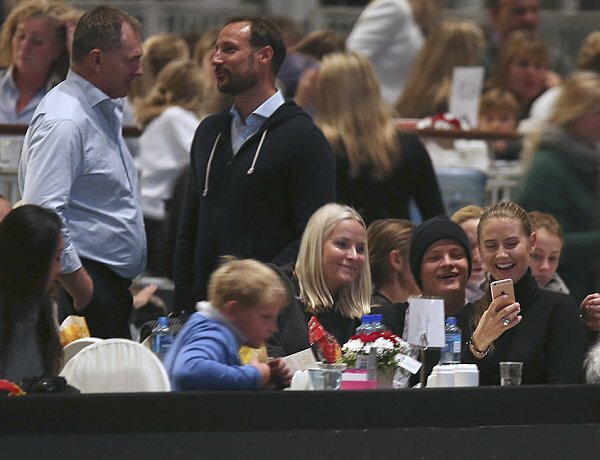 On October 15, 2016, Saturday, Royal Family of Norway, that is, Crown Prince Haakon, Crown Princess Mette-Marit, Prince Sverre Magnus and Crown Princess Mette-Marit's son Marius Borg Hoiby and his girlfriend Linn Helena Nilsen watched a Horse Show at Baerum Telenor Arena in Oslo, in which Princess Martha Louise participated in as a contestant. 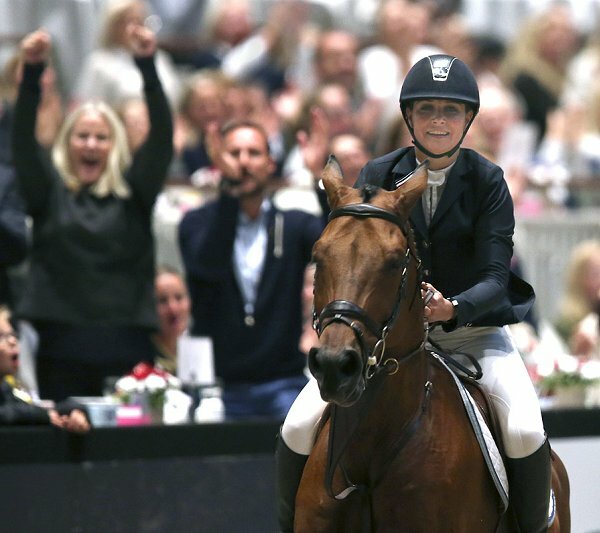 Princess Martha Louise completed the contest in the second place. 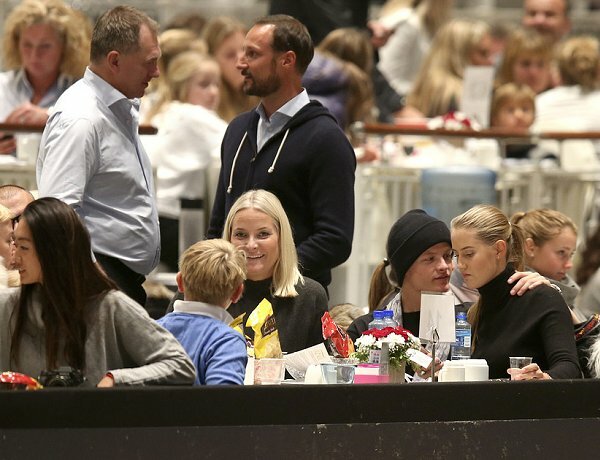 Marius Borg Hoiby went out in public with his girlfriend Linn Helena Nilsen for the first time. The photo of Crown Princess Mette-Marit cheering is so fun! It's nice to see them looking so at ease. Nice family scene. They look comfortable and content with each other. I really don't understand these royal ladies who like to "put on" on or pretend in front of the cameras. It looks really silly to me. MM obviously knows she's being photographed, so que the over the top gestures and huge smile. She's the only person with her arms in the air like that. It just looks so fake like she's saying "look at how happy me and my family are." I totally agree! Sometimes she is like a teenager. Or she wants to look like a normal Norwegian girl. I don't think she is playing to the cameras. I think she is one of the only Royas who doesn't do that. 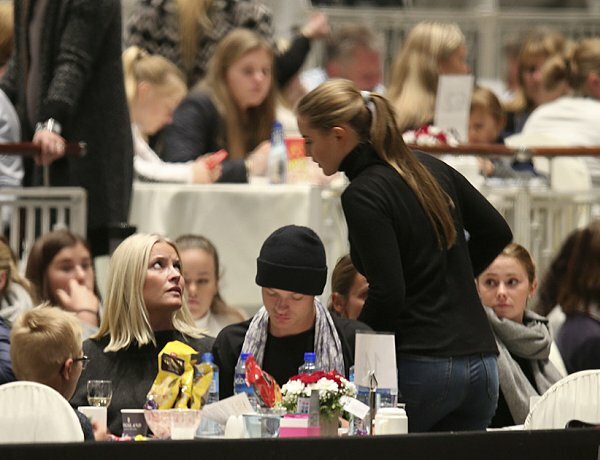 Those picture were taken with long lense, I do not think Mette Marit was even aware the family was photographed. Also Linda is right, MM is mostly very natural not pretending anything. They must be happy to be able to be sometimes so ordinary family. Absolutly!I really think that to. OMG Some of these lady's we just have to talk down don't we? Mette is a natural woman completely at ease and not stuck up and stiff as some. Here she is as a private person on a horse show shearing on her sister in law how are riding as we see on the pic. We have seen them be just as high spirit in UK at events like this, but Mette knows there are a man hiding several hundred meters away taking picture. Seriously?? Some of us get enthusiastic when we are at a sportsarena specially when we shear on our loved ones. Deal with it! End of the discussion look at brother Haakon. It should be noted that Princess Martha Louise was part of the show, because she was on horseback. She finished second in its class. 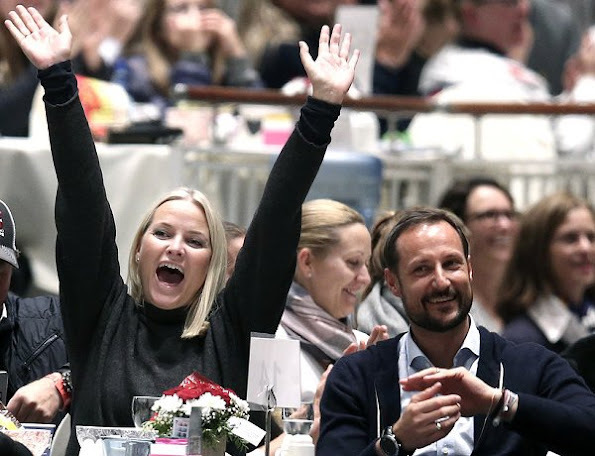 This explains, surely, enthusiasm Princess Mette Marit! Besides Prince Haakon was just as happy to see more photos. Could it be that Mette Marit just does not want to do the "expected" either in dress or behavior? She has the background of a rebel and seems to want to live as she wishes, not as others decide for her. Good for her! Her life won't be boring. Both Mette-Marit and Haakon were cheering and why shouldn't they if that is what they want to do. Martha-Louise is going through a divorce and maybe it's nice to have some family support. I also thought the photos where MM was interacting very casually with her son's girlfriend were lovely, they were just like any other Mum.